AccorHotels, which is present in 1,700 cities worldwide, has committed to developing urban farming and to planting 1,000 vegetable gardens by 2020. Though just a few months have passed since this commitment was announced, over 500 vegetable gardens have already been planted worldwide, from Bangkok to Rome and Sao Paulo to Kinshasa. In Paris, AccorHotels has signed the city’s “Objectif 100 hectares” Charter which sets out to create 100 hectares of green walls and roofs in the French capital, including 33 hectares dedicated to urban farming. Hotels like the Mercure Paris Boulogne Porte de Saint Cloud, are designing vegetable gardens with the support of an educational tool, and experimenting innovative urban farming techniques, such as aeroponics, a process for growing plants without soil, and hydroponics, culture carried out on a neutral and inert substrate (sand, clay balls, rock wool, etc.). The first harvests are expected in mid-June. 38 hotels in 13 countries are already using connected solutions to fight food waste in their kitchens and restaurants. The initiative has cut food waste by nearly 60% in the pilot hotels’ kitchens. That’s a total of €540,000 in estimated savings. The Pullman Dubai Creek City Center has partnered with Winnow, a leader in technology to fight food waste, to install a connected solution in its kitchen that weighs food before it is put in the bin. After using the device for a month, the 317-room hotel has reduced its food waste by 80% and is saving up to $400 a week. Some hotels are also applying other “anti-waste” solutions. For example, 20 Novotel, ibis, ibis Styles and Mercure hotels in France use the Too Good To Go app, selling off the day’s unsold meals at budget prices to neighborhood residents and tourists. In just a few months, they have redistributed over 1,000 meals thanks to this innovative system. In 2017, the Group plans to launch the wide-scale deployment of these devices and implement a system to monitor the results obtained in all its hotels worldwide. One of Planet 21’s two priorities is to achieve carbon neutral buildings. In 2016, the Group cut its energy consumption by 2.4% and CO² emissions by 3%. These results are even more encouraging because they were achieved despite particularly unfavorable world weather conditions in 2016 compared with 2015 since demand for heating and air-conditioning increased more than 4%. In France, the construction of the JO&JOE Paris establishment will kick off in September 2017. It will be the first Low Carbon labelled hotel. In the same vein, 24 Paris region hotels are together testing a “Low Carbon Plan”, and trying out a series of connected devices for the automatic collection and analysis of water and energy consumption data. This year, the AccorHotels establishments’ annual Earth Day event, “Planet 21 Day”, will see exceptional mobilization around the theme of food & beverage. The hotels are invited to highlight their greatest achievements in three categories: the fight against food waste, the creation of an urban vegetable garden and the offer of healthy, local food and drink. The winners will be selected by a vote on the social networks. For the first time, guests and internet users will be able to elect the “greenest” hotel. 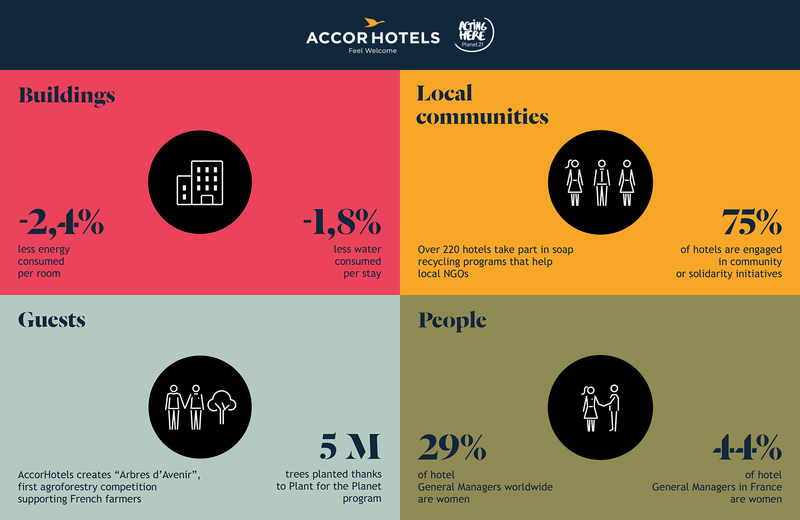 A year ago, AccorHotels unveiled its new, ambitious CSR commitments for 2020. The Group’s sustainable development program, Planet 21, focuses on four fields of action, namely employees, guests, partners and local communities, as well as two priority issues, food and sustainable buildings.